Did you know that the McDonald’s Corporation Headquarters are in Oak Brook, IL? Oh, yes. We drove past Hamburger University yesterday and, as much as I hate to admit it, the campus looked beautiful (apparently people even have weddings there!). There were also 2 REALLY spiffy looking McD’s – 2 floors, with chandeliers, and upholstered booths, and one of them even has the employees serve you at your table. Classy McD’s? Of course, the menu is the same greasy faire but you should see it. The second thing I wanted to tell you about was the cicadas, those nasty bugs that emerge out of the ground for their huge mating gathering every 17 years or so. Well, they are all over the place and it’s hard not to step on them. So what do you do with them? On a news segment last night, some Chicagoans decided to get creative with their cicadas and eat them – fried, as a crunchy salad topping, or even in their cocktails. Chocolate-covered cicadas? Probably. But seeing as one person described them as “not unpleasant,” I think I’ll stick with leaving them on the ground. Whenever we return from a trip, a certain family friend always asks “What’d ya do? Where’d ya eat?” and, more often than not, we can’t tell you the names of any place we ate. We are not the type of family that looks up fancy restaurants to eat at when traveling. If you want to find the best food in any place, eat where the locals eat. Usually the hole in the wall or the local home ends up being the best meal on the whole trip. 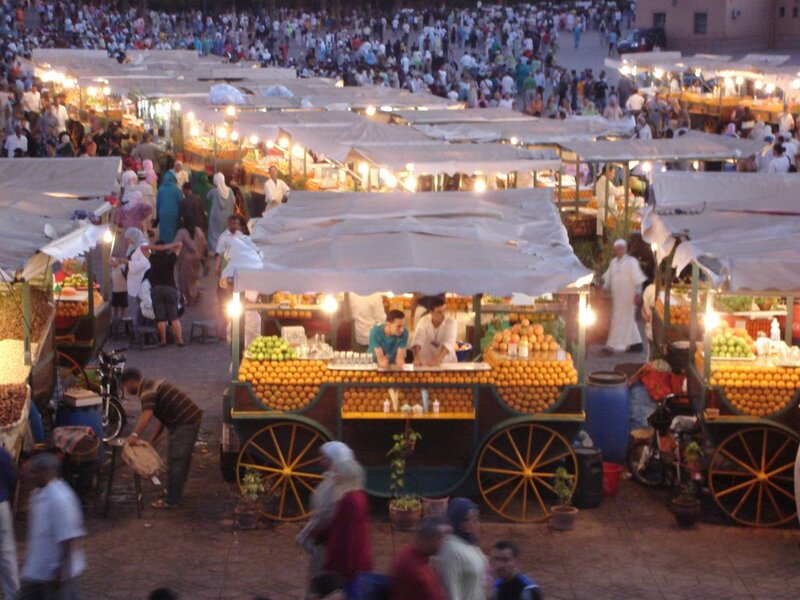 Our trip to Morocco was the first trip that I actually considered the food beforehand. (I used to be extremely picky, and would end up eating primarily bread, rice, potatoes on every trip). My first trip as a conscious eater, I guess…which is kind of sad, considering that I definitely missed out on a lot of good, exotic food in my earlier years. Anyways, culinary traveling is on the rise! I found an article on CNN.com yesterday, “A Growing Taste for Culinary Travel,” about how more and more people are interested in food due to the continuing popularity of cooking shows and the like. 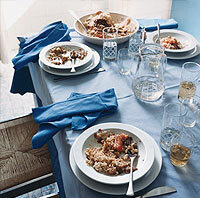 Not only can you arrange to take a cooking class pretty much anywhere, but you can even eat in local homes. Check out culinary schools, close to home or abroad- most offer classes for the public. Ok, so I’m back. Actually, I’ve been back for a week but have been lazy… slash packing and shopping for school because I go back to BROWN today! Anyways, our trip was fabulous. We ate lots of delicious food, but I don’t have many pictures for you because my camera spontaneously ate them….sorry. The food, because we were usually in tourist areas, was mostly the same at every restaurant. 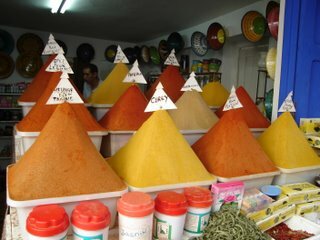 Needless to say, I am all tagine-d out and don’t want to hear about Moroccan food for awhile. Fresh Bread– Lots and lots of bread. Different breads are made on the streets and in bakeries at different times of day, but it’s usually a round loaf of crusty bread dusted with cornmeal. Moroccan Salad– Tomatoes, onions, a little olive oil and vinegar, parsley. Simple and delicious. Harira– A traditional first course soup made with lamb stock, lentils and vegetables. Served on the street at night. Tagines– Kind of like a stew, made in a pot called a tagine, usually with chicken or lamb. My favorite was Chicken with lemon peel and olives. 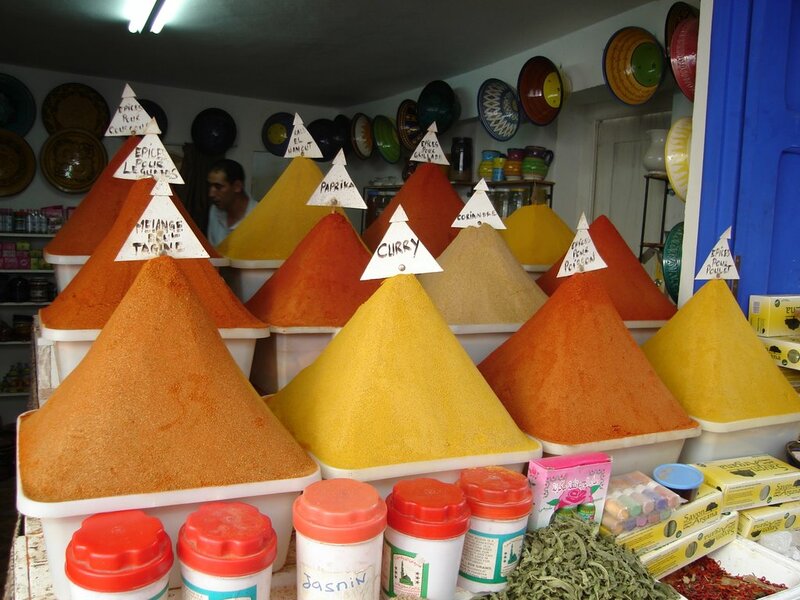 Couscous– Morocco’s favorite grain! Usually served with vegetables. Pastilla– A sweet and savory flaky pie thing usually filled with chicken and almonds, covered with powdered sugar. Brochettes– Basically kebabs, usually chicken or beef. Mint Tea– Green tea brewed with tons of fresh mint sprigs and loads of sugar. Freshly Squeezed OJ is also found everywhere. Olives, Almonds, Golden Raisins, and Argan nuts are locally grown. Or, if you are in one of the main tourist drags, you can probably find a good Italian or French restuarant. Moroccans make surprisingly good pizza! If you are cooking for yourself, make sure to explore the open-air food markets. Seeing the variety of spices at the spice market was amazing, and so fragrant. There were also fish markets (smelly) and meat markets. The Djemma El Fna (main square, below) in Marrakech is a must for adventurous eaters, where hundreds of food stalls are open every night serving anything you can think of. 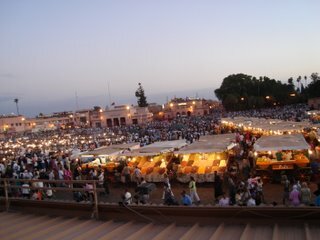 Djemma El Fna is crazy after sunset. In Essouaira and Marrakech, we rented houses but if you would like to check out the other places we stayed, feel free. They were wonderful. That’s all for now! Posting will resume once I am all moved in later today. SO we went to visit my relatives in North Carolina last weekend and, to be honest with you, I was a little nervous about the food. See, I’m a very picky eater, especially when it comes to meat. (If you can believe it, I used to be much pickier- just ask my mom! I’ve become slightly more adventurous in my old age of 20.) I try to be vegetarian, but I eat chicken pretty frequently at home and have been eating fish occasionally. However, I do not, have not, and will not ever eat red meat or pork. I don’t mean to offend all you meatatarians out there, but that’s the way it’s always been and that’s how it’s going to stay. Just a matter of personal taste. Anyways, pretty much anywhere south of New England tends to have alot of BBQ and hence, a lot of meat. We went out to eat a few times over the weekend, all at BBQ places. My relatives live north of Charlotte on a lake, so there’s alot of seafood too. One of the places we went to, you can drive up to in your boat, park it at the dock, and get out for dinner- which is the only appeal of that particular restaurant. I thought the food was ‘eh’- the menu consisted of mostly meat, and everything else was fried 😛 Everyone else seemed to enjoy it though. We also went to a Lancaster’s (I believe it’s a chain? ), which was actually pretty fun- the whole place is decorated with Nascar paraphenalia (NC is Nascar country). First, they bring you hushpuppies as an appetizer (whether you ask or not, but who wouldn’t?). I had never had hushpuppies before and if you’re a Northerner like me, you probably haven’t either. They are essentially fried cornbread balls- little golden nuggets of heaven! YUM. Crunchy on the outside, soft and sweet on the inside mmmmmmm. That was my weekend, basically. We grilled some, people teased me about my veggie burger. We boated, jetskied, hung out and relaxed– it was great!